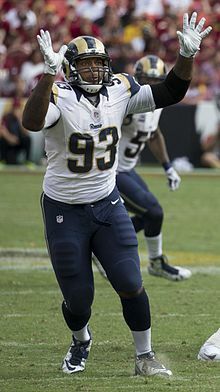 Ethan Colbey Westbrooks (born November 15, 1990) is an American football defensive end who is currently a free agent. He played college football at West Texas A&M University and signed with the Rams as an undrafted free agent in 2014. Westbrooks attended and played football at Franklin High School in Elk Grove, California where he earned All-league and All-conference honors. He also participated in track and field as he threw the shot put and discus. Westbrooks began his college career at San Joaquin Delta College where he played defensive end ending his freshman season with 12 sacks. He later transferred to Sacramento City College where he played defensive end and earned All-league honors All-conference accolades and All-state in 2011. He transferred to West Texas A&M where he was recognized as Lone Star Conference Defensive Lineman of the Year in 2012. Westbrooks had an outstanding first season in a Buffalo uniform as he played in all 15 games with 14 starts on the defensive line. He had 60 total tackles with 29 solo stops and led the team and conference with 28 tackles for loss for 139 yards. He led the team, the league, and the nation in sacks with a school-record 19.5 sacks for 116 yards. He had two pass breakups and a team-high 19 quarterback hurries, while forcing three fumbles. As a senior in 2012 with opponents keying in on him, Westbrooks numbers dropped significantly in 2013 with 43 tackles, 19.5 for losses, and seven sacks. He was selected to the 2014 East–West Shrine Game, and earned Defensive MVP honors during the game with two sacks and two more tackles for loss. Westbrooks went undrafted in the 2014 NFL Draft. He was signed as an undrafted free agent by the St. Louis Rams. He had a strong training camp and preseason, earning a spot on the 53-member active squad at the start of the 2014 season. During his rookie season in 2014, Westbrooks played 6 games making 5 tackles. In 2015, he played 13 games making 19 tackles with 2 sacks and a forced fumble. On September 11, 2017, Westbrook signed a one-year contract extension with the Rams. ^ "2010 Great Blue North Draft". NFL Draft Scout.com. February 29, 2000. Retrieved August 19, 2010. ^ Simmons, Myles (September 11, 2017). "Rams Sign Westbrooks to Extension". TheRams.com.